Bob Gordon (shown on left). If you watched TV as a kid in the Piedmont Golden Triangle in the 1960s and 1970s, you're probably familiar with Bob Gordon. I'm not even sure if the term "Piedmont Golden Triangle" is used anymore, but back then it was how people commonly referred to the cities of Winston-Salem, Greensboro, and High Point in North Carolina. I always stink at geography on Jeopardy, but remember from my school days that "piedmont" is the area between the Appalachians and the Atlantic Coast. Bob Gordon was a TV pioneer in Winston-Salem, having joined WSJS, Channel 12, in the 1950s. In the 1960s, he hosted a kids' show that ran at various times over the years. 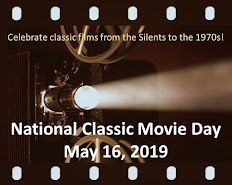 I remember watching it at 9:00 a.m. on weekdays and being introduced to delightful serials such as Zombies of the Stratosphere, The Purple Monster Strikes, and Radar Men on the Moon. Gordon was a ventriloquist and occasionally included segments with his dummy Van. However, his greatest claims to fame were his nifty dollar-folding tricks, his secret code, and his ability to put together a Moravian Star. The secret code used simple substitution, but cleverly employed a tac-tac-toe grid and an "X" to create its symbols. You could get a free decoding card by sending a self-addressed stamped envelope to Channel 12--but that wasn't necessary because the code was easy (still, I sent off for my card!). If you're unfamiliar with the Moravian Star, it's a 26-point star, composed of 18 square and eight triangular cone-shaped points. They're still a familiar site in Winston-Salem during Christmas season. However, the stars were packaged in parts and required assembly that represented a challenge for many people. Bob Gordon was a master--and would painstakingly walk viewers through assembling their stars. 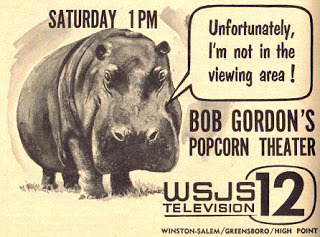 As kids' shows began to fade in the late 1960s, Bob Gordon ended his weekday series and began hosting Popcorn Theater (later changed to Bob Gordon Theater) on Saturday and sometimes Sunday afternoons. The format was similar to his earlier show, but was much longer (sometimes three hours) and included TV series (everything from the obscure Follow the Sun to more recent shows like The Invaders). Popcorn Theater still appeared on a sporadic basis when I moved from Winston-Salem in the mid-1970s. In addition to his regular shows, Bob Gordon also hosted one of my favorite local TV events: the Halloween Spooktacular. Starting at 8:30 on Halloween night, Channel 12 would show a marathon of classic horror movies. For at least the first year, Gordon and a handful of other local TV personalities donned monster make-up to bridge the movies. It was a special treat for kid viewers--especially because the only horror host in the Piedmont Golden Triangle, Dr. Paul Bearer from Channel 8's Shock Theater, departed for a Florida TV station in 1971. The Halloween Spooktacular continued for a few years on Channel 12, though I think it eventually did away with the hosts. Interestingly, it was popular enough that Channel 12 bumped Johnny Carson's Tonight Show to carry the Spooktacular (can't imagine that happening these days). When I was in college, I interned at Channel 12 for two summers. The station had been sold by then and the call letters changed to WXII. Bob Gordon only worked in the mornings; he hosted a half-hour talk show called Daybreak that preceded The Today Show at 5:30 a.m. I ran the cameras for the show when the regular camera operator was on vacation. Bob Gordon, whose real name was Robert Van Horn, was a genuine, unassuming man. He was as charming when the cameras were off as he was when performing in front of them. He was a fabulous source of information on the early days of local television. I'm not sure when he retired, but the Piedmont Golden Triangle lost a true icon when he did. This post is part of the Classic TV Horror Host Blogathon, sponsored by the Classic TV Blog Association. For a list of all the blogathon entries, click here. 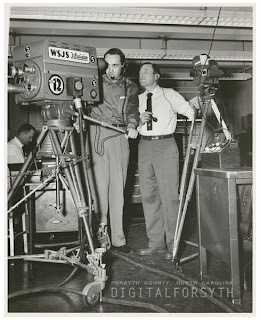 The wonderful TV ads appearing above are courtesy of Carroll W. Hall from his blog Piedmont Triad Nostalgia. The photograph of Bob Gordon is courtesy of Digital Forsyth. I truly enjoyed this post on Bob Gordon. I was really fascinated to see that the Halloween Spooktacular bumped The Tonight Show. I imagine this was quite a feat for WXII! It was especially nice to read that you found Bob to be a genuine and likable fellow. Wonderful post! 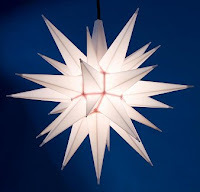 I forgot to add that I love Moravian stars and think it was cool that Bob could put one together so effortlessly. Lovely! They bumped Johnny Carson for the Spooktacular? Wonderful! How lucky for you to have a chance to actually work with and get to know Gordon. I'm really enjoying this blogathon on horror hosts. Lots of fun. Oh, and I couldn't help but think of A Christmas Story when you talked about the secret code: "...(still, I sent off for my card!)" Loved your piece, Ralphie! 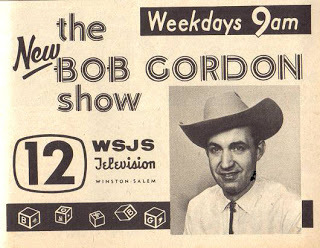 I grew up near Winston-Salem and remember Bob Gordon. I used to watch Popcorn Theater as a kid. I remember the Bob Gordon secret code and still have my card somewhere. I have seen it used in books too. Bob Gordon was a really nice man. I remember Dr. Paul Bearer and watched Shock Theater with my little brother. Nice memories and enjoyed reading this. Officially impressed Spooktacular bumped the King of Late Night! Kudos to the station for doing that for the occasion that lends itself to so many memories - Halloween! Your fondness for Bob Gordon comes right through here, Rick. Wonderful memories - thanks for sharing. Bob Gordon and his family lived 2 houses from my family, me as a kid. My dad and him were good friends-- he was the neighborhood hero. Recently was visiting W-S -- went to the old neighborhood-- I remember he making the Moravian Star-- he made ( helped my dad) do the one we had. I had forgotten about that-- every Christmas-- his family left small presents at our door-- for my family. He thought he was being " slick" but we knew it was him-- he was loved. Ruthi, thanks for sharing your Bob Gordon memories. He was a great guy! 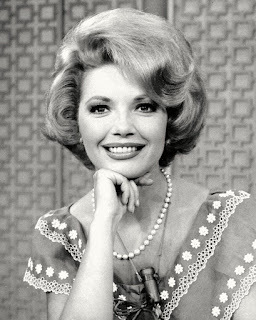 And another neighbor of our-- worked with Andy griffth's mom at some little dime store-- he was heading back to CA to start his new show-- came looking for his mom-- at the neighbors house-- came outside to the back yard and talked to us-- I remember this as if it was yesterday-- he was very very tall with red hair. The kids who lived at the house-- seemed to know him real well-- both moms had been friends for years-- that was pretty cool. http://www.journalnow.com/obituaries/van-horn-robert-gordon/article_b1429dd4-7a5e-5e78-8f61-ae226f51370f.html So long, Bob. Thanks for all the popcorn. Great article. I enjoyed his broadcasts and knew him from church. RIP Bob. Dr. Paul Bearer Is "Lurking for You!" Hitchcock's Swan Song: "Family Plot"